Grrreta: Happy New Year ! We wish you lots of snuggles, scritches, treats, love, and happiness in the new year. 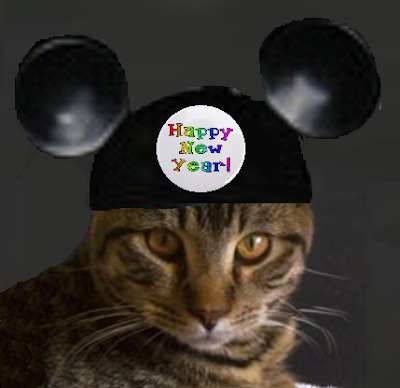 I am already working on my new year's resolution...to have happy new ears...um, I mean a happy new year. Happiest of New Years to you! Ha Ha, that is a wonderful mouse hat! We wish you and your family all the best in the New Year ahead!! Happy New Year to you, too! Happy New Year! My Mom wanted to put me in a New Year's Hat, but she couldn't find one. Hahaha! We wish you a healthy and happy new year 2010! Same to you! Love the Mickey ears! Happy New Year! We hope that 2010 is wonderful to you. We don't think any mice would be tricked by that. We're looking forward to sharing 2010 with you! Haha! Happy new ears and a Happy New year to you. Haha! We'd like some ears too! Happy New Year to you! You have a wonderful new year too! Happy New Year from me, Pimp and Moo! Happy New Year Grrreta !!! There's a mouse on your head!!! Happy New Year to you too! You are cute in your hat... we giggled! Those are great New ears. We like those. And Happy New Year too. Happy New Year. We are sure your mom can get a bit more relaxing done, now her study is finished. We hope you all have a happy and healthy new year! Thank you so much for your kind words to us on the loss of our darling Angel. It means so much to us that you cared. She was a very special girl. Happurry Mew Yeer to you too! You look like a Mousekateer in that hat! Cutest mousecat effur! Happy New Year to you too! LOVE your New Ears Resloution! You look so adorable in the big ears. Happy new year! We hopes yer Noo Year is da bestest! Grrreta, I think your old ears are much prettier! Hi! you have a lovely place! 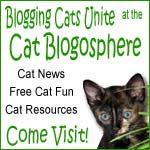 I invited to visit me, I love all cats just like you. Don't look now...I think we're being followed! Our beloved Grrreta went to the Rainbow Bridge on March 2, 2013. Grrreta had a job as a shop cat at an auto repair business until the shop closed down. She needed a new home, so our mommy adopted her. Over the years feral kitties Teddi, Ambrose, Clarence, and others joined our family. They were afraid of everything at first, but have made amazing progress and are now friendly, well mannered, and very happy.